It is one of the great, unsung steaks of Vegas. The dry-aged Creekstone Farms strip and rib eye at Nero’s competes with any steak in any steakhouse in town for pure, natural, unadulterated beefiness. The sauces — Bearnaise, Bordelaise, and green peppercorn — also take a back seat to no version we’ve ever had, and even the roasted beets and the mac ‘n cheese are about as good as you’ll get in our humble burg. In other words, those who appreciate great beef without all the celebrity chef folderol, know Nero’s is the place to go. Unfortunately, it seems we will soon bid adieu to all of this great grub, as Caesars is close to inking a deal with a major New York City steakhouse to move into the space. A smart move for Caesars, and maybe even a tasty one for steak lovers, but we will not soon forget how good the food has been in this uncelebrated steakhouse, that has, for the past few years, been so much better than most of its clientele appreciates. That great steak went down with some great truffle-talk with Francesco Mazzini of Urbani Truffles, and was paid for by Caesars Palace. I officially bid adieu to my sole remaining reason to visit Caesars. I loved Nero’s, but can no longer abide the rest of the establishment. serious, are those sides really that good? the mac n cheese looks pretty dried out and those nice chunks of beeets sure go down well. And whats that protein with the white anchovy and chewed up canned truffle? And the bernaise looks a dabble too thick. Its forming “peaks” too easy when rested. 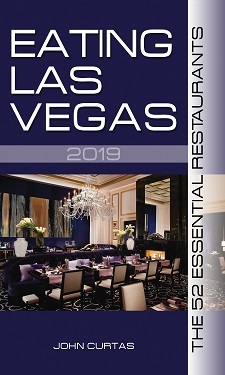 ELV responds: Remember, every restaurant in Las Vegas would be a steakhouse if it could be. The protein was sea bass, the truffles weren’t canned and the Bearnaise was perfect. Almost as good as Jacques Lameloise’s version. Don’t mess with the Zohan.